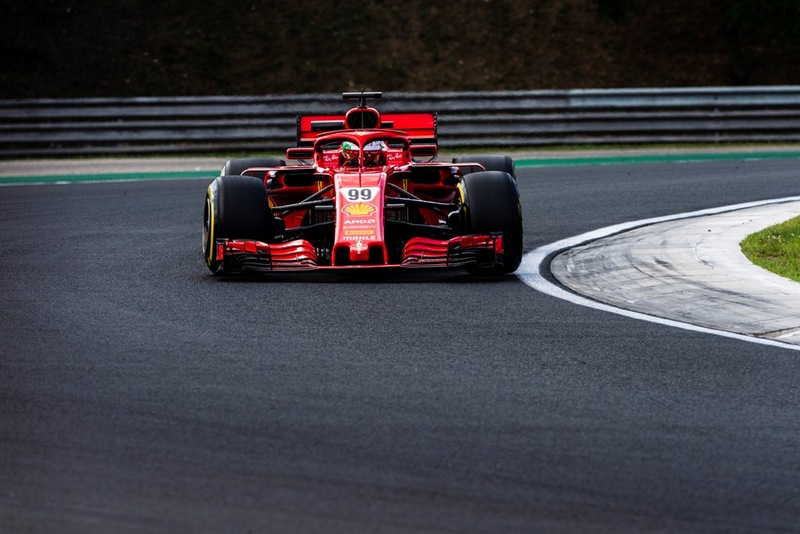 Antonio Giovinazzi with Ferrari was the fastest driver on the first day of the Hungaroring Formula 1 test. His running was cut short by a sudden and heavy downpour just as the team was preparing to send him out for his final run. However, on this first day of testing at the Hungaroring, the programme was successfully completed and Giovinazzi’s second “rookie day,” after the one in which he took part in Barcelona, ended with a best lap of 1:15.648min, set on the Hypersoft tyres and his lap total was 96. Marcus Ericson (Sauber) had the second best time while Brendon Hartley was third. “It was a productive day of testing. We almost completed the planned programme, with a short interruption caused by the rain that came suddenly. Thankfully, we managed to conclude the main part before the change in weather, so it didn’t affect us too much. We obtained some interesting results, and tried different set-up options for the second half of the season. Now we have to analyse the results and learn from them. It was a positive way to end the first part of the season. Now it is time to have a small break, and to recharge our batteries for the upcoming set of races. Give it a week and I will not be able to wait until I get back in the car, though. It will be great to come back and drive on one of the best tracks of the season in Spa-Francorchamps”, Ericson said.